New platform is said to be "an app store for user-generated hardware"
bitLab: build it... and they might come. 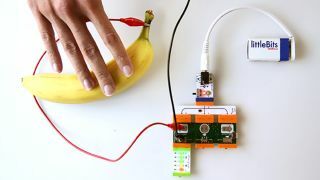 Billed as "an app store for user-generated hardware," mini modular maestro littleBits has announced the bitLab. This promises to put development of future littleBits modules in the hands of would-be developers the world over, giving them the tools to build them and the ecosystem to sell them. If you want to bring your dream module to life, the first thing you'll need is the hardware development kit, which enables you to go about building a physical prototype and costs $40. Once you've done this, your design can be submitted to the bitLab, where the community can vote on it. Those designs that receive more than 1000 votes will be assessed by littleBits to determine production feasibility. If your module does go on the market, you'll receive 10% of the revenue for those sold. "When Apple launched the App Store, many apps were games, many were frivolous. But now - six years later - there are more than 1.3 million apps that have distributed nearly $15 billion to the software developer community," said Ayah Bdeir, CEO and founder of littleBits. "We believe the same thing will happen with hardware - developers just need one common platform to develop on, a supply chain that powers it, and a marketplace for community and distribution. We believe the bitLab will be the hardware industry's solution to innovation, scale and growth." The bitLab is being launched with five 'bitLab celebrities', one of whom, MaKey MaKey CEO and founder Jay Silver, is excited by the possibilities it offers. "We're thrilled to be among the first to develop for the bitLab. When we started this collaboration, we knew it could be huge - every object in the world can become a button for littleBits and every littleBits sensor can trigger your real world - from video games to web apps and keystrokes. "It was an adventure to prototype the MaKey MaKey module and we're excited to see what else the community dreams up. This is one small Bit for makers and one giant leap for maker kind." The bitLab is open for submissions now.